Ace Hotel New York invites you to take a trip to Storm King Art Center. For the month of August, we’re proudly displaying contemporary works on loan from the 500-acre institution — peeks at two special exhibitions on view in 2014: Zhang Huan: Evoking Tradition and Outlooks: Virginia Overton, as well as short video interviews and installation footage. Located about an hour north of the George Washington Bridge, Storm King Art Center has greeted guests from around the world with the best in large-scale and site-specific work for over 50 years. Founded in 1960 by Ralph E. Ogden and H. Peter Stern, Storm King is home to over 100 post-WWII sculptures by the likes of Alexander Calder, Sol LeWitt, Louise Nevelson, Richard Serra, Isamu Noguchi, Mark di Suvero, Maya Lin and Ursula von Rydingsvard. The dramatic landscape of farm fields, formal allées, natural woodlands, lawns, native grasses and wetlands is not only home to art, but a wide variety of wildlife including red fox, wild turkey, groundhogs, red-tail hawks, turtles and more. Storm King is open to the public through November 30, and Ace is here to help you get there. We've teamed to offer free admission to hotel guests — talk to the front desk for full details. More information, including daily bus packages from Port Authority, can be found at stormking.org/visit. If you plan your stay in August for a visit through November, we’ll get you 10% off the best rate available, at acehotel.com/stormkingrooms. 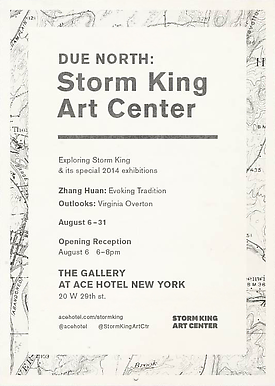 Opening reception August 6, 6-8pm.Ace Hotel New York invites you to take a trip to Storm King Art Center. For the month of August, we’re proudly displaying contemporary works on loan from the 500-acre institution — peeks at two special exhibitions on view in 2014: Zhang Huan: Evoking Tradition and Outlooks: Virginia Overton, as well as short video interviews and installation footage. Opening reception August 6, 6-8pm.